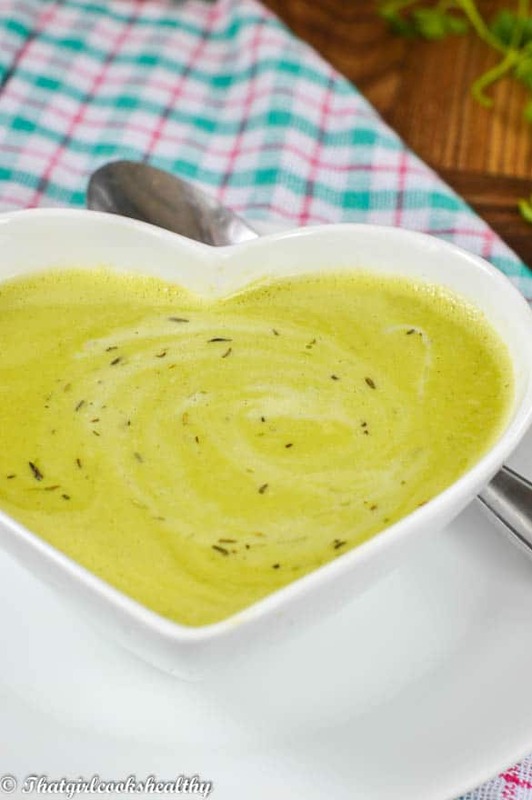 Simple green pea soup – this creamy vegan soup is made from organic garden peas, homemade dairy free butter, stock, thyme and coconut milk to name a few. Today I am in limbo, my mood has somewhat elevated since I woke up this morning. The weather has a enormous impact on my mood. Earlier, the heavens decided to open, unleashing what seemed like an oceans worth of rainfall. I despise two things; rain and the cold, on the contrary I love the sunshine and the warmth it radiates.However, I’m more melancholy when it pours with rain, maybe I suffer from SADS? Thankfully as the rain began to cease, the sun peered through the ominous dark clouds. Perhaps I can go for that long power walk as I had previously planned (fingers crossed people). Enough of my weather rant, I this simple green pea soup for my loved ones today and needless to say it went down a treat. Garden peas are not really a crop I tend to eat religiously, in fact, I seldom eat them whole. My chosen method of cooking peas is pureed in a soup. There is much controversy surrounding crops like soya beans, papaya, corn, peas, sugarbeets, cotton seed oil just to name a few. Scientists have been hybridizing crops for years now and the effects that it has had on human being is still inconclusive. As I learn more about GMO crops I will be sure to share my knowledge with you all. I always recommend purchasing organic food where possible because the farming methods are free from artificial chemicals, pesticides and other harmful substances like fertiliser. Sadly organic isn’t always available nor is it affordable for some, hopefully this list will help to filter out those questionable foods. Whenever I cook with garden peas I do one of two things; either source them locally from a trustworthy farmers market or purchase them organic. On this occasion, the cost is outweighed by the infrequency in purchasing, so rest assured, they are numerous ways to enjoy some of our favourite foods without compromising our health. For this recipe I used my homemade butter and vegetable stock which use I highly recommend using. Traditionally green pea soup is enriched with a heavy cream, as I wanted to stay within the realm of being dairy free I used coconut milk. The taste isn’t altered at all, infact it replicates the creaminess of cows milk. 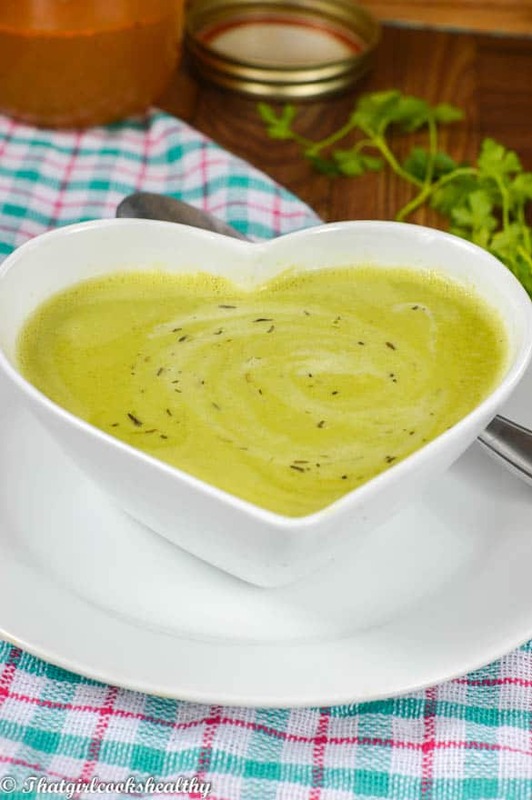 This soup is low carb, with a healthy balance of starch, vitamin b which help to boost metabolism, folic acid – an essential vitamin for expectant mothers to prevent defects in new born babies. High in iron which help to transport oxygen in the blood stream, keeping anemia at bay and vitamin k – assists with the formation of platelets (red blood cells which stop excessive bleeding). In a saucepan under low heat, sautee the onions until slightly brown with the coconut oil and butter. Start to add the thyme, parsley, garden peas and vegetable stock and leave to simmer for 5-7 minutes. After 7 minutes, the peas should be tender, so stir in the pink salt and coconut milk and simmer for another minute. Finally transfer the soup mixture into a high speed blender and pulse for 2 minutes. Use a high speed blender to puree the soup. Ensure to sautee onions as caramelizing is a flavour enhancer. yum.. i love a good pea soup, i love that you used coconut oil and milk too! never tried that before, thanks for the idea. Hi Thalia, glad to have inspired you. I hope you managed to try it and like it with the adaptations. I love pea soup, especially with mint. But I really like that you have made this with coconut milk. Yum! Thanks Dannii, pea soup with mint is gorgeous too. Ive just made the homemade butter, in preparation to make this soup, but the butter is so delicious Im having to guard against other hands that keep sneaking into the cupboard to take a finger-licking swipe! I love your recipes, thank you, and please keep them coming. Aww awesome, it is addictive isn’t it? I hope you liked the soup too.